The mobile view of the Yelp site application shown on an iPhone mobile, shows the TSA Checkpoint Terminal 1 at the Los Angeles International Terminal location in Los Angeles, Aug. 18, 2015. Watch out TSA: You'll be joining the ranks of beauty salons, taco stands, and other services reviewed on Yelp, and Uncle Sam says it will take the online ratings into account to improve what the government calls "customer satisfaction." Under a deal with Yelp, the government will officially recognize the public's star ratings on its federal agencies, from the Transportation Security Administration to national parks. 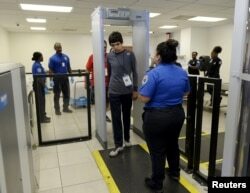 FILE - Autistic boy Jeffery Jr. Simonton (C) walks through the metal detector while a Transportation Security Administration (TSA) agent looks on. "In some ways, it augments our democracy," said Luther Lowe, Yelp's vice president of public policy. He said the platform could shine the light on both what works and what doesn't in the federal government — just as it directs people to the yummiest Indian restaurant in town or the best nail salon. Lowe said there's no need for TSA agents or other federal officials to worry: Positive reviews already outweigh negative comments on Yelp for businesses, and he doesn't expect that will change with people reviewing federal agencies. It'll still take weeks before it is up and running. Andy Stoltzfus, vice president of Voce Connect, a digital-consulting firm, said the deal is not what is expected of a massive federal government. "It's very inspiring to see them adapting to the digital age," he said. Per the government's terms, advertisements will be removed from official government pages to prevent perceived endorsements. San Diego resident Erik Carstensen, who flies frequently, said it's an interesting idea, but he's not sure how effective it will be.